« So you say you want a revolution? why is that freaky looking fish romantically embracing that crab? and why is there a little clam beneath them looking up in a loving manor? what the hell? But this logo bothers me on 2 levels… the tender loving creatures they are attempting to feed to me and the just weird proportions of the fish… what is going on with those eyes? This reminds me of my passionate distaste for pet names based on food. (Puddin’ of course will always be an exception. That dog was rad). And yeah, that is wrong, wrong, wrong. 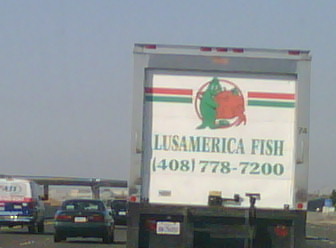 That fish is definitely sick and possibly twisted. I’m sorry the freeway subjected you to such a sight.